No pets or kids but this could be a good business option. The Seaview is clean and affordable and just 3 miles from Peterhead. There's a lovely fresh and contemporay feel to this one. You'll find the hotel in the pretty coastal village of Boddam in Aberdeenshire. The sea cliffs here rise to above 200 feet which means you get some spectacular views of the sea. Boddam, like its neighbour Peterhead, was at one time vibrant fishing village and there remain fragments of a castle nearby. The lighthouse tower is over thirty metres high with a mighty 166 steps leading to the top. 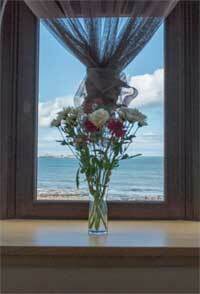 The 6 en suite bedrooms enjoy terrific views of Boddam harbour and little extras include bath robes and free toiletries. All rooms have flat-screen TV.